Joseph “Joe” Anthony Mix, 87, of Beaufort, husband of Delinda Ann McCormick Mix, died Wednesday, November 07, 2018 at his residence. Joe was born in Chicago, IL on November 03, 1931. He was a son of the late Bronislaus John and Armella Catherine Hellmuth Mix. Joe graduated from Chicago Latin School, earned his Bachelor of Science from Middlebury College in 1953, and graduated from Massachusetts Institute of Technology (MIT) as a Sloane Scholar. He served in the United States Army as a Corporal. 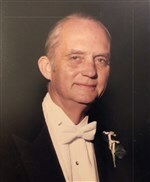 He was employed by The Kendall Company as an Executive from the 1960’s through the mid 1980’s. Joe was also owner of Island Outfitters, a hunting and fishing equipment store, for 20 years beginning in the mid 1980’s. He was a member of Alpha Tau Omega Fraternity, a member of the Parish Church of St Helena, and a volunteer with the Boys and Girls Clubs of Beaufort and the Lowcountry where he received numerous National Awards. Joe’s hobbies included fishing at Pritchards Island and Costa Rica. His favorite memory was a trip around-the-world with his wife on the Queen Mary II. He helped build the pier on Hunting Island and restored numerous historical buildings in and around Beaufort. Joe is survived by his wife of 63 years and his children Robert Anthony Mix and wife Carmen Rosa, Stephen Matthew Mix and wife Victoria Leigh, and Amelia Jean Mix Poggi and husband Francis Xavier; brother Bronislaus John Mix Jr.; grandchildren Caroline Mix Stapleton (Alex), Grace Mix Myrick (William), Austin McCormick Mix, Eleonor Mix Yehl (Walter), Samuel Francis Poggi ( Alissa), James Joseph Poggi, Henry Leo Poggi, Armella Diane Poggi, and Mary Delinda Poggi; and great grandchildren Eliza Stapleton and Aiden Poggi. A memorial service will be held 11:00 a.m., Monday, November 12th at the Parish Church of St. Helena. Following the service, a reception will be held at the Parish Hall. In lieu of flowers, memorials may be made to The Boys and Girls Club of Northern Beaufort County, 10 Pinckney Colony Road, Suite 103, Bluffton, SC 29909 or to the Parish Church of St. Helena, P.O. Box 1043, Beaufort, SC 29901. I was saddened to learn of Joe’s death. To me he was a wonderful man and that he gave so much of his time to the Boys and Girls Club speaks volumes about his generosity and his character. I frequently visited the thrift shop where he would be and we had many nice chats that always left me feeling good. His smile alone could make you feel better about oneself and others. I will sorely miss him as a great many others will as well. To his family I offer my heart felt condolences. Remember this, HE did make a difference in the lives of a great many others as well as your own. I am sadden to learn of Mr. Joe Mix passing. Mr. Mix made a positive impact in the lives of thousand of Beaufort area Boy’s and Girl’s Club members. Because of him we had a positive safe and learning environment for our after school five core programs and other activities. Because of Joe, the Club had many outstanding awards. Most notable, was a First Place winner, ‘’The Youth For Unity Award’’ given at the National B’s & G’s National Conference in Atlanta, Ga. I will never forget that smile that only he had. It was beautiful. Joe thanks for making a difference in our lives. My deepest sympathy to Mrs. Mix and family. Joe was a kind and encouraging supporter during my tienure at Penn Center. He allowed us to conduct tours of Ann Fripp Plantation and House after his remarkable restoration of the site. Then worked diligently to help the Center purchase the Frogmore Inn that he and Henry Chambers built years earlier. He always wanted It to belong to Penn Center. I considered Joe a caring friend and will miss him although we did not see or talk each other for a number of years. May memory of his caring life continuously comfort you and us all. We have only known Joe for the past few years since we moved to Beaufort, but consider him a friend, as that is how he treated us, and how we feel of him. Joe was a great guy to talk with as he volunteered at the Boys Club Thrift Store, his smile and stories were historical, enlightening and fun to listen to. We will miss you dear friend, and know you will find peace in Gods loving arms. May your family find comfort in knowing that you are safe in heaven, love ya Joe! Many thanks to Joe for his leadership, stewardship and friendship. So sorry medical appointment prevents me from attending memorial service and reaching out to Lin and Steve to thank them for their warmth over the years. Great me leave their mark on many – Joe’s will be lasting on me.